Try a new cooking concept and create the ultimate in barbecue dishes with the new Akwill Green Energy Barbecue. The supreme BBQ Grill and BBQ Smoker. Order yours now. The Akwill BBQ Smoker is not like other BBQ Smokers it is light and manoeuvrable, easy to clean, heats up easily and quickly and can cook up to 8 chickens at once. Our Grills on sale use superheated smoke which results in an good appearance and great taste to the grilled food. The BBQ grills up to 8 chickens at a time and can also process pastries, biscuits, other meats, vegetables and various types of seafood using the unique coco smoke. Ideal for a catering company looking for a superb new cooking experience. Ideal for outdoor caterers, sandwich shops, street sellers, events caterers and for the larger domestic environment. It is even ideal for someone in the Party industry looking for a big BBQ Smoker for all their entertainment food needs. The Akwill BBQ smoker uses a cooking method – popular in the United States but relatively unknown in the UK – so that you can slowly smoke food at a low heat, and then finish it with the crisp outer layer by turning up the temperature. By purchasing our green energy barbecue system, you will make a life changing investment. Everyone will notice the difference in the way the food you cook looks and tastes. Whether it is meat, seafood, vegetables or fruit when you use our BBQ Grill the end result will be moist, tender, juicy and tasty using our green barbecue system. Watch the video of ribs being prepared and cooked in the Akwill BBQ Smoker then see our grills on sale and order yours today. 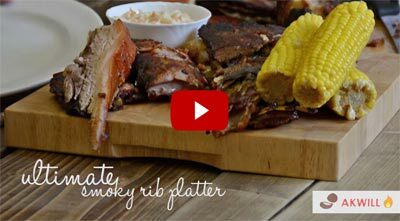 If you would like to watch other videos of some delicious meals prepared in the BBQ go to the Recipes page. Don’t just take our word for how well the Akwill BBQ Smoker cooks, here are comments from former Pub Food Award winner, UK Professional Chef Paul Morgan. Read his full review, it makes tasty reading. The result from the Akwill BBQ smoker is deliciously different, flavoursome food, created in classic barbecue fashion. Therefore the BBQ Smoker is different to other Grills on sale that are available to you, just read our testimonials to see why. Click here to purchase our Grills and BBQ Fuel.